Yesterday Blogger was not letting me post (sorry) today it seems to be OK. Here is a rose bush. 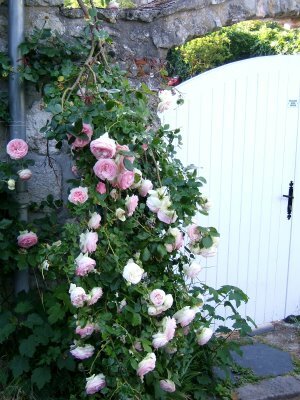 It's a lovely bush, called 'Pierre de Ronsard', I believe, and it's a very hard rose to grow, being rather fragile and delicate. Not the pale green, beige, and rose tints in the flower.